INS Kamorta is first indigenously developed anti-submarine warfare corvette by India under the project name p 28. ins kamorta is designed by the Indian navy and GSRE (garden reach shipbuilders and engineering ) has done the detailed design. Kamorta class ships will be vital for Indian navy thanks for increasing Chinese navy's increasing submarine force and mass manufacturing of newer diesel-electric and nuclear-powered subs ( SSN ) by China.It is very clear that Indian navy is giving priority to ASW ships and submarine, therefore, there is a plan for future variant as well which may get advanced stealth features and weapon systems and eight of those are anticipated. Kamorta class ships are a great stride in the indigenous development of naval ships.She has a composite superstructure providing higher strength to weight ratio and stealth characteristics.Its hull is made of indigenously developed steel.This steel was developed by dodo's material research laboratory and being produced by SAIL Bhilai plant.It was also used in the production of the first carrier made in India INS Vikrant.Kamotra incorporates more than 90 % of is its components made in India. 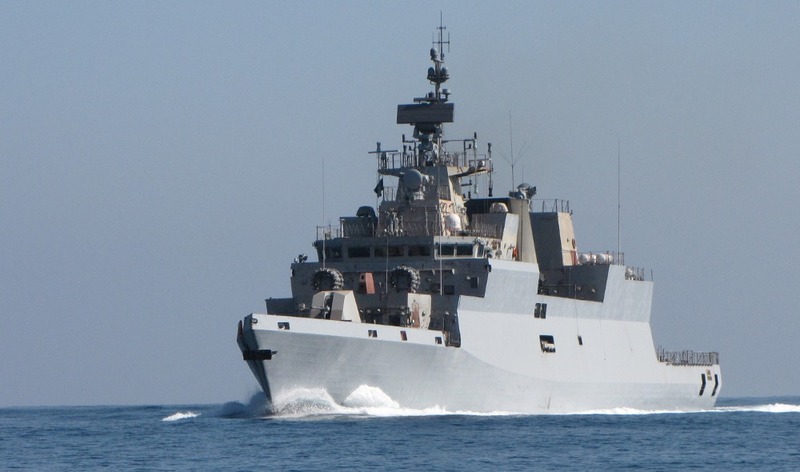 Kamorta class operate drdo developed radar name Revati. It is the naval version of the radar developed for early warning in Akash air defence system naming 3D central acuition radar (CAR).it has a range more than 200 km for aircraft size targets and have many naval mode for better performance in high seas. Its main defence system Kavach was also developed by drdo and provide all around protection by the means of decoys and countermeasures. Kamorta class ships are designated as corvette but she has a displacement same as the most of the frigates around the world.ins Kamorta has X-shaped hull improving underwater stealth capabilities and a stealthy superstructure made of composites this is why it is Indian navy most stealthy warship.Kamorta has CODAD (combined diesel and diesel) propulsion systems. Diesel engines are provided by France company Pielstick. Her diesel engines are raft mounted and designing of the gearbox is helped by DCNS which is also a shipbuilding company of France. Her gearbox is produced by ELCON. She has 16 cell vls system for Barak 1 and srgm oto bareda 76 mm gun mounted on the front and two rocket launchers are also placed but there is no anti-ship missile even if there is a lot of space available for the same.she is equipped with HUMSA NG next generation panoramic sonar and will be equipped with ALTAS towed array sonar.ALTAS is currently in development phase.